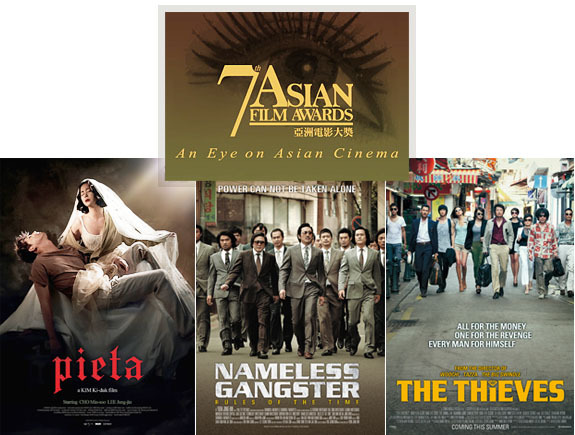 KIM Ki-duk’s Pieta has been nominated for best film at the 7th Asian Film Awards. It was recognized in two additional catgeories, for Best Director and Best Actress (CHO Min-soo). YOON Jong-bin’s Nameless Gangster: Rules of the Time will compete in 6 sections; Best Actor (CHOI Min-shik), Best Supporting Actor (HA Jung-woo), Best New Actor (KIM Sung-kyun), Best Script, Best Art Design and Best Original Score. KIM Hye-soo and JUN Ji-hyun of CHOI Dong-hoon’s The Thieves are also up for a chance to win the Best Supporting Actress award. The Thieves was also nominated for Best Cinematogrpahy and the Best Editing awards. Doomsday Book directed by KIM Jee-woon and YIM Pil-sung, and R2B by KIM Dong-won are nominees in the Best Special Effects category. CHO Sung-hee’s A Werewolf Boy wioll also vie for Best Costume. The awards presentation will be held in Hong Kong on March 18th.